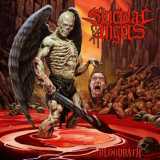 Greece’s Suicidal Angels has kept an admirably heady pace with their songwriting, reaching their fourth studio album since releasing their debut back in 2007. So that’s nearly a record per year, blimey. Considering that their previous release, Dead Again, was a slight dip in overall moshtastic ownage when compared to its predecessor, Sanctify The Darkness, the danger of too-many-too-quickly looms in the air. Would it have been beneficial to let those riffs and frequent bursts of rage simmer for a while longer? Based on Bloodbath, maybe a touch of yes but also a considerable amount of naaah, just rip it! The opening title track and Moshing Crew don’t waste any time in accelerating from 0 to around 99 while sprinkling the occasional ride-symbal heavy mid-burner section in there. The latter of these tunes should be an especially surefire crowdpleaser on the live concert front. Vocalist/guitarist Nick Melissourgos has his gruff Greek take on Max Cavalera down to the same convincing level that it has been thus far. I guess going for some variety with Mille-style shreaks or a few growls here and there wouldn’t be too shabby, but if it’s not outright broken, not of the utmost importance to fix it, it seems. What’s oddest about this album is that the divide between great songs and mediocre ones is based on an almost direct opposite reason than the one that prevailed on Dead Again. There it felt like the songs deviating the most from the frenetic, breakneck moshing vein were the best. On Bloodbath, it’s the speed demons that rule the day. Chaos and Legacy Of Pain are left plodding woefully in a mud pit of mediocre riffs, even if the latter features a nifty vocal guest show from Bolt Thrower’s Karl Willets. I must however admit that there is one tune of a more experimental nature that does nail things nicely. Bleeding Cries brings in some trickier rhythmic arrangements and a more versatile song structure, up to the point that one could even hear a slight hint of Metallica’s And Justice For All-days in the mix, even if that kind of straight-up progginess isn’t exactly behind the machination. But as it clocks in at 6 minutes, perhaps slightly longer pieces are something Suicidal Angels could explore further to great success. The production on the album is good stuff, blending a notably breathing, raw edge with a balanced soundscape that doesn’t leave any single element disadvantaged. The bass is handled very well, which warrants bonus points. Overall, Greece’s gift to thrash fans does an admirable job on their fourth album that should give the pits a good dose of audial fuel, even if it doesn’t offer anything utterly special in relation to the band’s own discography or the genre at large.